ADMIRAL DAVID BEATTY Portrait Signed. Admiral of the Fleet David Richard Beatty, DSO, 1st Earl Beatty. British naval officer. Commander of the British battle cruiser squadron at the Battle of Jutland. Autograph signature of David Beatty below an offset-litho printed portrait mounted on post-card. 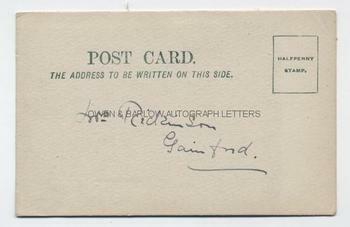 Addressed on verso to Mrs Rickinson, Gainsford. The card measures approx. 5.5 x 3.5 inches. Fine. Admiral David Beatty served in the Sudanese War and the Boxer Rebellion. In WW1 his aggressive tactics whilst commanding the British battle cruisers at the Battle of Jutland were contrasted with the more cautious approach of the overall commander, Admiral John Jellicoe and he eventually succeeded Jellicoe as Admiral of the Fleet. 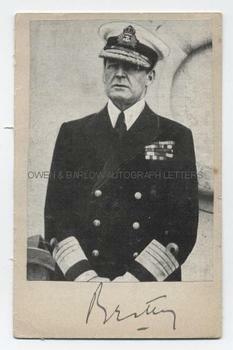 David Beatty took the surrender of the German navy in 1918 and then served as First Sea Lord.